I am so excited to be the "lead learner" and Principal of Burke County Middle School. Please allow me to tell you a little bit about myself. I am originally from the state of Mississippi, but I have spent most of my life in the great state of Georgia. In 1990, I graduated from Turner County High School which is located in rural southwest Georgia. For the next four years, I attended Valdosta State University where I obtained a Bachelor of Science degree in Middle Grades Education. Due to my involvement on campus at Valdosta State, I decided to attend the University of Georgia where I received a Master of Education degree in Higher Education (Student Affairs). 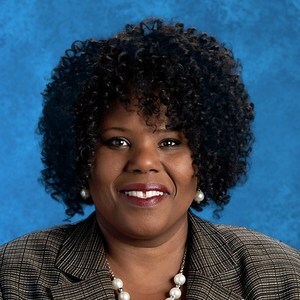 In May 2010, I earned the Doctor of Education degree from Georgia Southern University and later started teaching part-time as an adjunct professor at Georgia Regents University. In 1996, I began my teaching career with Richmond County School System at Glenn Hills Middle School. After teaching science for eight years, I later served as an Assistant Principal in Columbia County at Evans Middle School. I became Principal of Burke County Middle School in 2012, have 20 years of experience as an educator, and very much enjoy my work each day. My spiritual values, family, and friends mean the most to me. Besides spending time with my beautiful nieces, Jacora and Jackie, I also love to read, write, and fellowship with friends. I have a wonderful husband, G.D.Reynolds who is a teacher as well, and we have so much fun traveling the world together. We love traveling so much that we have visited eight foreign countries and nearly every state in our country. Educational exposure has helped me to have a vision of more that I want to accomplish and/or do. It also helped me to expand my own personal interests. Coming from a rural life in South Georgia, I never dreamt that I would actually be able to visit Paris, London, Rome, Switzerland, and a host of other countries, but we have been so richly blessed to do so due to the education I have received. I feel my life’s purpose is to help children to have the same if not better foundation needed to succeed because there is a strong connection between a good education and good opportunities that are made available later in life. We all want more for the next generation than what we have. My hope is that our students excel and thrive in their lives just as my teachers wished the same for me. At Burke County Middle School, we will ensure all of our children receive the highest quality of education by using a nurturing spirit of support, unconditional faith and love. Academically challenging assignments and high levels of support go hand in hand at BCMS. Please join with us and know that you are welcomed to help us in our quest to assist our students with becoming the best they can be. Thank you for allowing me to serve among champions as the Principal of Burke County Middle School.